While I have dipped in and out of the Harry Potter books and movies over the years, my interest has been mild in comparison with that of my soon-to-be fifteen-year-old daughter who has read every one at least twice and knows everything there is to know about Harry Potter. For my fifteenth birthday my parents took me to see Nicholas Nickleby in London which I still remember vividly over three decades later. So when I found out we were going to be spending the summer in London I tried and tried to get seats for the West End production of Harry Potter and the Cursed Child for my own daughter’s birthday. But there weren’t any — unless you wanted to pay 500 pounds a ticket, which I did not. As we embarked on our perilous drive through the far-too-narrow Sussex country lanes in our bright blue rent-a-car, my daughter filled me in on the plot of every Harry Potter book to date, so I would be fully in the loop for the start of the play, which takes place 20 years after the final book ends, as Harry Potter’s son is about to head off to Hogwarts. After a time, I’m deep in my own thoughts. We’ve been catching up with people I haven’t seen for far too long, Oxford and the Sussex countryside are looking lovely and I’m close to tears, feeling the loss of the very English life I might have lived had I not moved to the United States and become a stand-up comic 26 years ago. “If you could change anything in your life, Mom, anything at all, what would it be?” my daughter asks me as we crawl through traffic on the M 40. “I’d change the past,” I say. 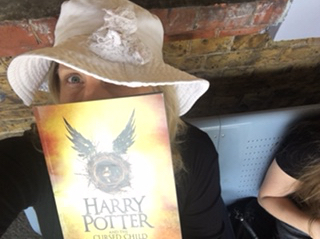 The author at the West End production of Harry Potter and the Cursed Child. J K Rowling’s masterful script has been conjured into one of most exciting pieces of theater I have ever seen. In addition to the magical affects and deeply drawn characters who swirl across the stage in dark flowing cloaks, the story at the heart of it makes us feel and think. We all have something in our past that caused us pain. We wouldn’t be human if we didn’t. But if it hadn’t happened – the thing that changed everything – while we can’t know what might have happened, we can be sure we wouldn’t be exactly where we are today. If I hadn’t left England for the United States, apart from everything else, the girl with sparkling eyes eating all my Maltesers would never have been born. And so, later that night, when she asks me again if I’d change my own past if I could, I say “No way, kiddo” — crystal clear on the answer.